The following books are must reads for anyone who cares about this country and wants to understand how and why the un-American culture has taken over and dominated the American political and cultural scene since the 1960s. The importance, the relevance and the enlightenment each offers can not be overstated. I have highlighted each of them and provided a synopsis or bullet points of each book so that you can see the author's great contribution in shedding light on what has happened to America and how we can indeed "take back our country". Throughout this brilliant book, we get a poignant (and hysterical) peek behind the leftist curtain and learn what motivates them, how they operate, how they have co-opted media, education, government, and more. Best of all, Kahane offers us an ingenious, point-by-point roadmap for taking our country back. If you haven’t read Kahane before, you’re in for a treat. 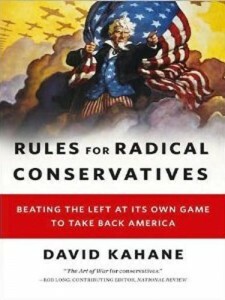 If you haven’t even heard of Kahane before, you’re in for an even bigger treat as Rules for Radical Conservatives is the perfect place to delve into his wide and witty body of work. And while the left may refer to him as their Benedict Arnold, I see him as our own Benjamin Franklin-–a man of incalculable intellect who can’t help but dispense his wisdom with an extraordinary sense of humor. A mericans have come to tolerate, embrace and even champion many things that would have horrified their parents' generation-from easy divorce and unrestricted abortion-on-demand to extreme body piercing and teaching homosexuality to grade-schoolers. Does that mean today's Americans are inherently more morally confused and depraved than previous generations? Of course not, says veteran journalist David Kupelian. But they have fallen victim to some of the most stunningly brilliant and compelling marketing campaigns in modern history. T his is the most highlighted book in my library. This woman was President of NOW and is a devout "feminist" and a lesbian. So you are hearing it from 'the horses mouth'. And for the first time you are hearing honest admonitions from an 'insider' instead of lies and propaganda designed to camouflage the issue and insult your intelligence. Ms. Bruce smashes the facades of “Tolerance,” “Understanding,” and other Leftist slogans to reveal the ugly truth of their agenda. 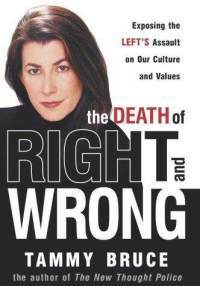 As a gay activist and former president of the Los Angeles chapter of the National Organization of Women, she witnessed firsthand the Left’s attempts to undermine our millennia-old code of morals and values, aided by politically biased media and academia. And if the news headlines of today are any indication, they’re winning the culture war. Unless we act now, we are doomed at the hands of special interest groups on the Left who want nothing more than to undermine our ability to judge right from wrong in order to foist their own selfish, anything-goes society on the rest of us. This book reveals what they’re doing, how they’re doing it, and what we can do to restore decency. 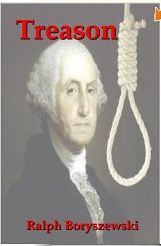 Considering the legal and complex nature of the story, this book is not only made interesting, but is an easy read even for those lucky ones who are unfamiliar with the The Scum of America Club and the corrupt American judicial system. Mr. Schuelke does an excellent job of walking you through his ordeal and deciphering the arrogant and privileged world that lawyers and their judges operate in. When you finish reading this book, you will realize that when lawyers and judges say that "we have the best justice system in the world' it is indeed the very best they could ever wish for! There could be a million books written on the shameful greed and arrogance of America's Lawyer Class. 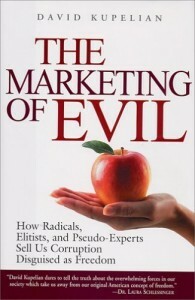 This prophetic book was published in 1997 and is the Bible for all who recognize the cancer that is destroying America. 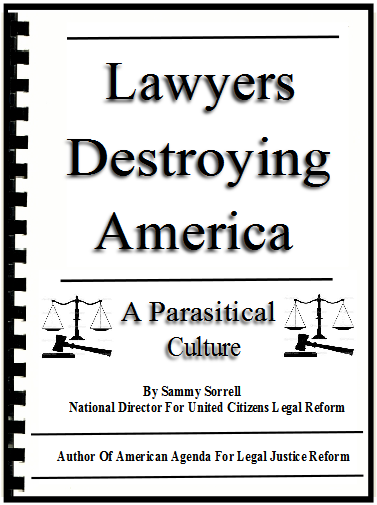 Sammy Sorrell -National Director For United Citizens For Legal Reform, does a complete and masterful job of exposing in great detail how this cancer has managed to consume the American government and American culture. Sorrell leaves no stone unturned in answering how and why America is no longer The Land of The Free but has become The Land of Lawyers who control every aspect of our lives. Their dominance of the Judiciary did not satisfy them. With the help of an apathetic and gullible electorate, lawyers have managed to take over the legislature and the Executive branches of local, state and the Federal government. 'Depressing but Enlightening" – "Sad but True" are but a few ways to describe this book. It should be read by ALL because more than anything else it is a wake up call to everyone who loves this country and wants the truth and the answers no one else has the courage to expose. This is an amazing read especially considering this book was published back in 1907. It is written by John R. Dos Passos, a lawyer who see’s the damage that his profession is inflicting on the country and warns that if not curtailed, it will indeed get worse to the point of destroying America. Fast forward to 1997 and ‘low and behold’; Lawyers Destroying America is published. 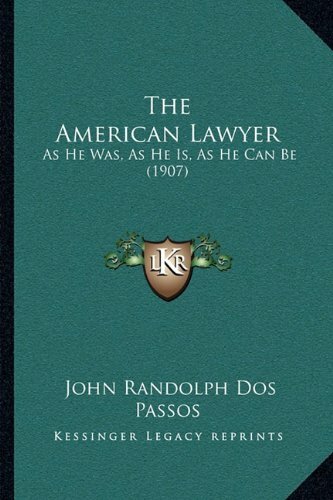 Dos Passos did a brilliant job of foretelling the damages that were inevitable from a lawyer controlled society. He also offered some realistic remedies that are even more relevant today. Click on image for bullet points from the mind and ‘crystal ball’ of John R. Dos Passos.